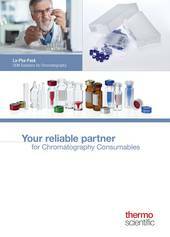 3:LC/MS and GC/MS Certified KITs. 4:Standard, Certified and High Performance 96 and 384 Position Block Systems. 5:20mm Ultra High Temperature (UHT) Closure. 6:9mm Short Thread Cap (Phthalate Free Seal) with assembled aluminum liner. 9:Programmable Electronic High Power Crimp Station. Completely new designed ergonomic hand-held tool with easy push button for a completely joint-friendly work position. Unique ultra slim design of the crimping jaws is perfect for in-tray crimping of the vial. Slim jaw shape allows for the first time an optical control of the crimping process. Combines convenient large sample series processing with cleanroom usability. The weight of the new pneumatic hand-held tool generation is reduced by 50%. The optional balancer helps to save space on the lab bench and keeps the crimper clean and ready to use in reach. © 2019 Thermo Fisher Scientific Inc. All rights reserved. All trademarks are the property of Thermo Fisher Scientific Inc. and its subsidiaries. Specifications, terms and pricing are subject to change. Not all products are available in all countries. Please consult your local sales representative for details.